Concentrated formula can be used full-strength or diluted with water to remove grease, coffee and juice stains, ink, lipstick and more from washable surfaces. For use indoors or outdoors. Fresh lemon scent is ideal for kitchens, break rooms, kids rooms, toy rooms, nurseries, nursing homes and bathrooms. Nonabrasive, nontoxic, biodegradable and nonflammable. VOC Compliant. Environmentally conscious. 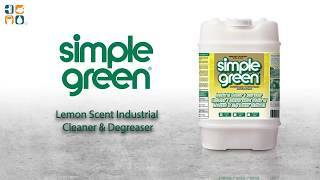 Simple Green Concentrate Cleaner, 24 oz. Trigger Spray Bottles, 12 Bottles per Carton.